When I first started out doing makeup I think the number one thing that came to mind was BRUSHES! 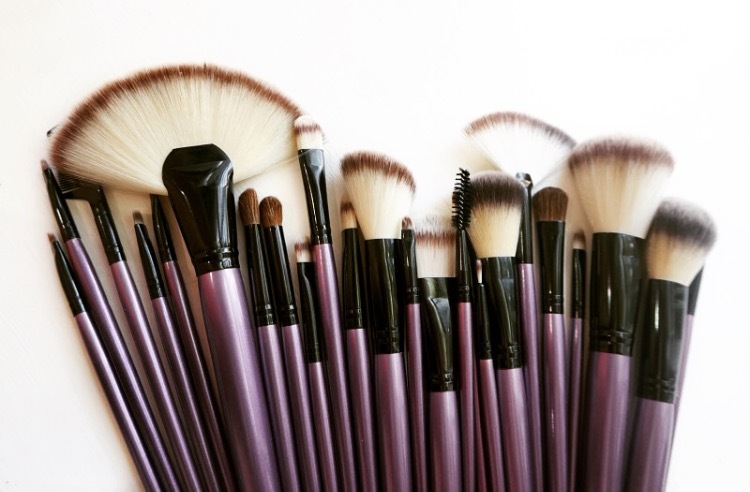 How do you know what brushes to have? What do they all do? Where do you get them? Most importantly how do you afford all of the brushes that you need? I think the first places I went to when I just had gotten into makeup was places like MAC, Sephora, Sigma etc. Now when you look for brushes at places like that, what's the first thing you notice? Price. One brush at a big named company will run you $30-50 bucks. Making getting a whole collection of brushes seem super unobtainable. So what I have done is grow my collection very slowly. Now being that I am a makeup artist and full time blogger, I have definitely accumulated a ton of brushes from various companies over the past few years, so I think I have a decent understanding on the quality of brushes. I've tried everything from $3 brushes to $50 brushes and am here to tell you that just because something costs more doesn't always make it the best. Which is why I have been searching for a company who makes great quality brushes for less. One day while I was browsing online I came across what seemed as the solution to every beginner's problems. A website called www.mymakeupbrushset.com. They have tons and tons and tons of brush sets on there site that all come with different brush types, and in different colors. They also even have those new artist style brushes that are wildly popular one instagram right now! I'm definitely going to have to try those next!! Now the set that I got is called the "Purple Rain" brush set and I believe it came with 24 brushes and a carrying case, The case is absolutely perfect if your an upcoming artist and need brushes for your kit! By having a brush roll it makes your freelance set up look extremely professional, even if your just starting out! Something to think about when looking into brushes is the quality of the fibers. Some brushes will shed if they are not made right and if your working on a client, having brush hairs all over them is definitely not ideal. The brushes from the My Makeup Brush Set that I got have not seemed to shed at all, and are made up of animal cruelty free synthetic fibers. Also one thing that I always look for in brushes is length, When you use brushes that have longer handles to them you get to manipulate the application better. Hold the brush closer to the end and you get a much lighter application then if you put your hand close to the bristles. Quite often when you buy brushes the longer the handle, the more expensive the brush & in most cases when you get a brush kit they end up being shorter handled brushes, which in my opinion do not look nearly as professional. I received my package very quickly and had absolutely no problems with shipping. I would say it came in about 4-5 business days. 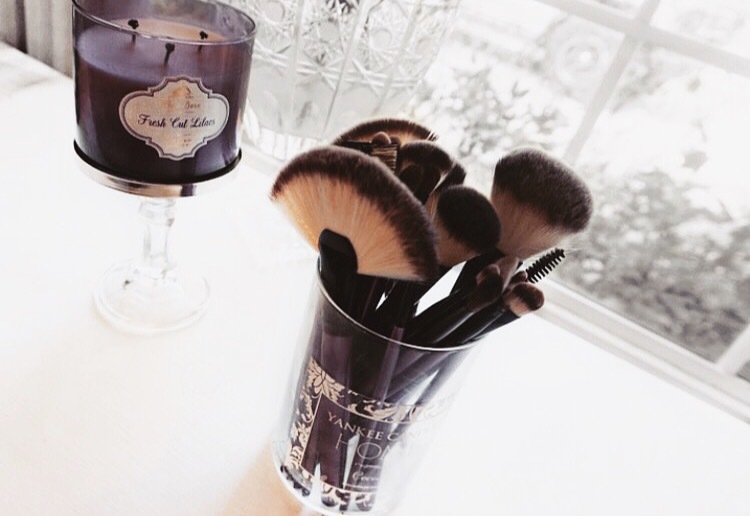 If you want to get your own cute simple little brush holder for your vanity like the one I've showed above, all you have to do is find an old candle! I used an old jar candle with a pretty label from yankee candle. Stick the old candle in the freezer for a few hours to remove the remaining wax. Next take a small knife and pop out the excess wax. Finally wash the inside out with a sponge to remove any candle residue, and there you go! 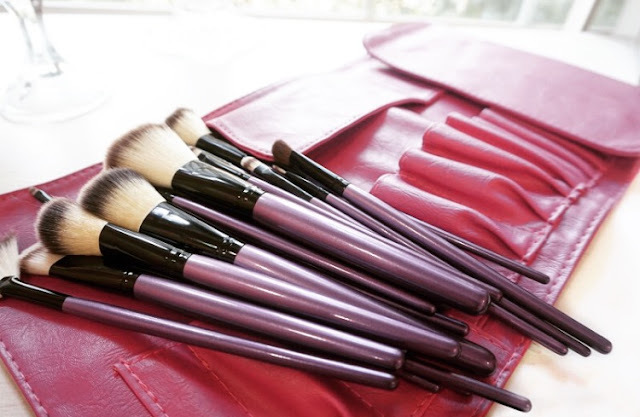 A simple DIY idea to hold your brushes at home with out spending any extra cash!